‘崇禎紀元後再甲子四月摹’ 라는 묵서가 있는 측면전신좌상은 1744년 작품으로, 『영당기적』에 ‘崇禎紀元後, 再甲子四月, 影子移摹四本, 正面一仄面三. 畵師張敬周’라고 밝혀져 있어 장경주의 작품으로 확인된다. 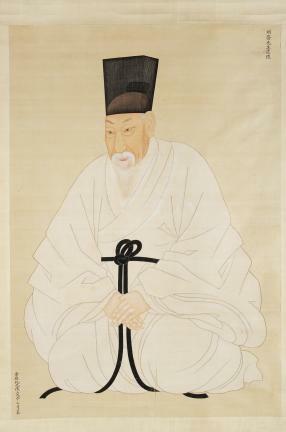 ‘崇禎紀元後三戊申二月摹’라는 묵서를 지닌 1788년작 2점은 『영당기적』의 내용을 통해 이명기가 모사했음을 알 수 있다. '영당기적'에 따르면 정면 1본과 측면 1본은 신법을 가미하여 그리고, 구본의 화법을 후대에 전하지 않을 수 없어 구법을 따라 측면 1본을 그렸다(故倣甲子正面點化之例, 略加新法, 摹出正仄各一本, 而舊本畵法, 亦不可不傳於後. 故又出仄面一本, 純用舊摸法)고 한다. 이명기가 제작한 현전하는 초상화 2점은 장경주 필 윤증상과 그 모습이 흡사한 구법에 따라 그린 측면상과 이명기의 개성적 화풍으로 그린 입체표현이 선명한 신법의 측면상이다. 정면과 측면의 흉상 2점은 화면에 묵서가 남아있지 않아 제작연대를 정확하게 알 수 없으나 정면상과 측면상은 같은 비단에 같은 화가의 솜씨로 추정된다. 측면상을 전신상과 비교해 보면 크기나 기법이 장경주가 그린 초상화와 같다. 초상화와 함께 전하는『영당기적』은 윤증 초상의 제작과 관련된 기록을 담은 필사본으로, 1711년 卞良이 윤증의 초상을 처음으로 그렸던 사례부터 1744년 장경주, 1788년 이명기, 1885년 이한철이 모사할 때까지 4번의 제작사례를 기록하였다. 그 내용은 제작일정 및 제작된 초상의 수, 구본 및 신본의 봉안과정 등을 상세히 담고 있다. 조선시대 사상사에서 윤증이 차지하는 비중과 함께 현존하는 장경주와 이명기가 그린 은 조선후기를 대표할만한 뛰어난 회화적 격조를 지니고 있어 중요성을 지닌다. 아울러 '영당기적'은 초상화 제작과 이모과정 그리고 세초의 전통을 알 수 있는 귀중한 자료이다. 보물로 지정 예고된 이들 작품 외에도 종가에는 1919년 및 1935년작 전신좌상 및 소묘초본이 여러 점 전하고 있다. 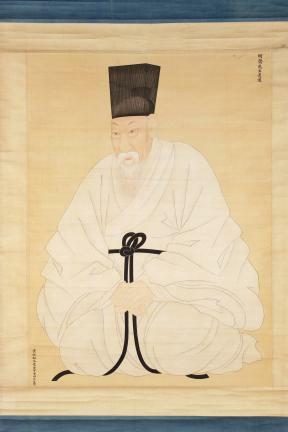 The Five Portraits of Yun Jeung (1629-1714), a prominent scholar and politician of the mid-Joseon Dynasty, have been designated as Treasure No. 1495. They include two bust portraits painted by Jang Gyeong-ju in 1744, one three-quarter view and one full-frontal portrait; and two full-length portraits painted by Yi Myeong-gi in 1788, both of which are three-quarter views, although one of them was executed using old techniques, the other with new techniques. 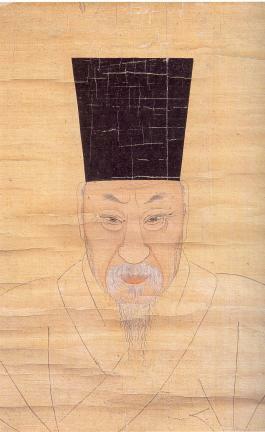 They were all produced after Yun's death: Jang Gyeong-ju copied from an earlier version by Byeon Sang-byeok, while Yi Myeong-gi produced his versions based on Jang's works, according to the Track Records of the Portrait Hall (Yeongdang gijeok) handed down through Yun's descendants. The Track Records of the Portrait Hall is a hand-copied edition containing detailed information about the production of Yun's Portraits, which were executed on four occasions. 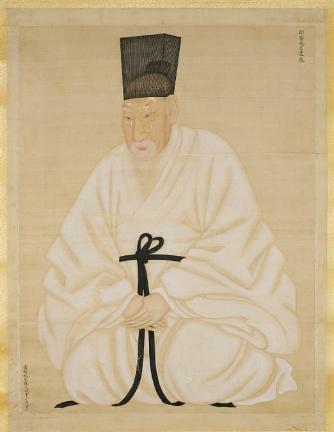 The Track Records state that the portraits were first painted by Byeon Sang-byeok (also known as Byeon Ryang) in 1711, followed by Jang Gyeong-ju in 1744, Yi Myeong-gi in 1788, and Yi Han-cheol in 1885. The records present in detail the production date of each portrait, the number of works produced, the process of creating or copying each portrait, and the enshrinement procedure, as well as the tradition of burning drafts. 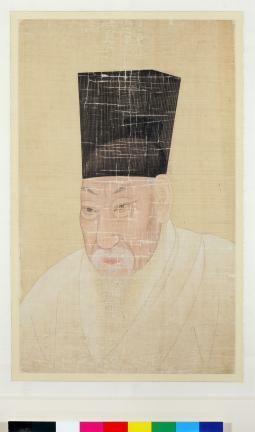 All of Yun's extant portraits are important in view of the subject's prominence in the history of Joseon philosophy and politics, as well as the painters' reputation as leading portraitists of the latter part of the Joseon Dynasty. Apart from these portraits, the head family of the Yun Clan also keeps two other full-length portraits, painted in 1919 and 1935, and many draft sketches.